When Selma native Eunice Johnson died in January at age 93, the world lost a trailblazing businesswoman who was one of the first to market cosmetics toward black women and supported her husband’s efforts to start Ebony magazine. And with her death came the recent cancellation of a national — and Birmingham — institution: The Ebony Fashion Fair show, which for years featured over-the-top couture designs, entertaining storylines, and high-stepping female and debonair male models. “When I went, I got a chance to go on an exotic fashion vacation — you saw things that you may not see in Birmingham, and that’s what I liked,” said Sarah Mitchell, vice president of the Birmingham Alumnae Chapter of Delta Sigma Theta Sorority, which has sponsored the show in Birmingham since 1966. Fans of the fashion show not only got excited about the fashions they’d see on the models, but also on the people attending the show. The event was an annual tradition for many who gave show tickets as Christmas gifts, or gathered loved ones for what felt like a red carpet affair without the hefty pricetag. The traveling show helped charitable organizations such as Delta Sigma Theta Sorority raise money to help support its public service projects and scholarship programs. It’s not known whether the show will be revived later. Rosalyn Childress, president of the Birmingham Alumnae Chapter of Delta Sigma Theta Sorority, said the organization will continue to fund its public service projects despite losing the show this year. Childress said Johnson’s daughter, Linda Johnson Rice, told her she regretted the spring show had been canceled and that two designer garments from the Ebony Fashion Fair vault would be donated to the organization so it could auction them to help with their fundraising efforts. Other charities that host the show will also be offered two dresses, according to a press release from Johnson Publishing Co.
Johnson’s husband, John H. Johnson, founded Ebony magazine in 1945 — a publication his wife named. He started Jet magazine in 1951, and she started the traveling fashion show in 1958. 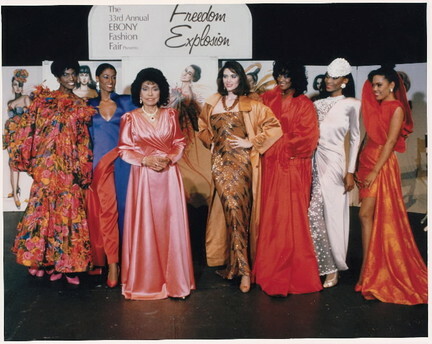 The Fashion Fair cosmetics line was born after she noticed that the black models in the show were having trouble finding makeup shades that matched their skin. A maven of style, Johnson set the tone for a show that was tough getting designs for in the beginning. Johnson and her husband met resistance in Europe from some designers who thought that white women wouldn’t value their designs if they were worn by black women, according to the Ebony/Jet Web site. The couple held their ground, and a few leading designers finally relented, agreeing to sell fashions to the Johnsons. Johnson became known in fashion circles as the biggest buyer of haute couture from Europe. Over time, she would spend $1 million each year on 200 ensembles for the show. She also supported young and emerging designers such as Pierre Cardin, Valentino and Yves Saint Laurent when others were hesitant to take a chance on them. Just like Johnson left her mark on the fashion world, she also left her mark on Alabama. She graduated from Talladega College, was a member of Delta Sigma Theta Sorority, received an honorary doctorate from Talladega and donated $1 million to the school in 2003. Other Alabama charitable organizations that have benefited from the show included those in Huntsville, Anniston, Florence, Dothan, Montgomery, Selma and Talladega. Since its inception, the show has raised more than $55 million for various non-profit groups. Roy Yvette Clements, who worked on Ebony Fashion Fair shows for Talladega College, the Friends of Talladega College and for the Birmingham Alumnae Chapter of Delta Sigma Theta Sorority, said Johnson never wanted recognition for her efforts. Her goal was to help others without fanfare.